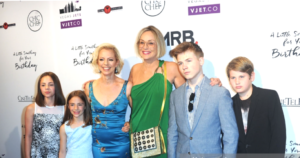 My interview with writer/director Susan Walter of the film, All I Wish, a romantic comedy starring Sharon Stone as a late forties single woman who hasn’t found her dream career or the love of her life was eye-opening. The script was written over 13 years ago and has found its way into the hands of many other directors—namely male directors. Waiting, in this case, was exactly the right move to make as the script is with its rightful owner who turned her vision into her own dream. Sarah Knight Adamson: I want to thank you so much for speaking with me, and congratulations on your film, All I Wish. It’s fabulous. Susan Walter: Oh, thank you, Sarah. Thanks so much. SW: Not so much during the filming of it, but definitely, now that the film is done, and I’m seeing the appreciation not just from women who are over forty and over fifty, but across the board. People in their twenties, even, saying, “Thank you so much for showing somebody of that age who’s still discovering who they are, who’s still falling down and picking themselves back up.” It’s really come into a crystal clear view for me now. In making it and working with Sharon, we were so into the minutiae, and finding the moments, and being free, that I didn’t really have that analytical lens on it, but I sure do now. SKA: Well, that’s amazing. How does it feel to, personally take a leap of faith, and follow Sharon’s advice of casting her in the daughter role instead of the mother? That was super exciting, and people really responded to that, especially women who’ve seen the film. SKA: Oh, isn’t that wonderful? It’s such an empowering film. Honestly, it resonated with me as well. What did you learn now, this time, as a filmmaker at the helm during the project? SW: I learned something that I kind of already knew, but it came into focus for me, and that is, as the writer of the script, you control every aspect of the process, what words go on the page and the shape of the scenes, and then you have what really is kind of a rough roadmap, but it doesn’t really represent ultimately what the film is going to be. Handing these characters over to Sharon, Tony, Ellen and Famke, Liza, and Caitlin, they had their own version, and it was so much better. They came to their characters with intricately conceived backstories with emotional truths that were personal to them, and that’s what made it work, and the best decision I ever made as a director was realizing, “You know what? You’re not really in control anymore. You’re just here, kind of directing, conducting the orchestra, and just let them sing, and get out of their way, because they all knew what they were doing, and that was so freeing, and by following their lead, I really think what you see is honest, emotionally grounded performances, and that, ultimately, if the films works, is why it works. SKA: Oh my goodness. You are a director that I’m sure actors dream of. That is fantastic. SW: That’s right, because I want to make another movie. SKA: Great! I know that, from my own personal life. I was a teacher of gifted students, and using the idea of collaboration, we were able to do so much more by working collaboratively together, and listening to ideas, and so, that’s bravo to you. That’s fantastic. On to Sharon. She is so amazing in this role, and oh my goodness, the camera loves her, and I love seeing her different ranges of emotions. Did she surprise you in any way? The thing about Sharon, she’s technically perfect. When we were sitting there in the edit, and sometimes, you have to use a take because it matches, or the actor got the right line. She was always technically perfect, and wow, what a gift. SKA: Well, of all my favorite movie scenes ever, and I’ve reviewed over a thousand movies in my career, Sharon’s movie scene in Casino when she throws the poker chips in the air resonated with me when I saw it in the theater, and it still does. SW: You remember the moment because the stories sort of fade away, but you remember the characters, and you remember the moments. SKA: Exactly. Her playfulness, her love of life, her freedom, and I honestly feel that you captured that in this film. It is so cool. That is unbelievable, and I’m so excited for you because I know how … I’ve talked with many directors over the years, and writers, and to have the double whammy of not only writing a script, but then being able to direct it, that is really not easy in Hollywood, and I give you a lot of credit for that. How this would been a different process for you if you weren’t able to direct your own script? SW: Well, I wrote the script thirteen years ago, and there were other directors who wanted to direct it, and essentially, I wrote it, and I was like, “Oh, I’ll direct it,” and then it got set up, and the producer looked at me and said, “First time director? A woman? Not going to happen, not with me,” and I just swallowed that, and honestly, it was a different time, and I was advised by very smart agents to just accept that, and let them make the best version of my movie that they could with the most money that they could get. And so, I sort of stood out of the way, and I watched … It was kind of a revolving door of directors. Four came and went, and the fifth one came in, and when she started asking me questions about the script, “Why did you write it this way, and what’s the central question here?” I did a rewrite, and I did it not based on her ideas, but based on her questions, and I took complete ownership of it, maybe for the first time, really, and she went on to do something else. She got an offer she couldn’t refuse, and having done the work, I was like, “It’s not negotiable. I’m doing it. Yes, it was a long road, but it worked out. SKA: Good for you. Congratulations again. That’s awesome. I love that story. Ellen Burstyn. We have to talk about her. She’s so lovely in your film. Those were my favorite scenes with she and Sharon. They’re so touching, so real. Can you tell me how it was, how it really felt directing such a legend? SW: Wow, yeah. I mean, the directing process really started when she flew it, and I met her at her hotel room, and she was very serious. I think she was testing me a little bit because we sat down, there was no chit chat. We sat right down at her table in her suite, and we looked at the script, and we went through it word by word, and she wanted to make sure that I knew, when I chose my words, what I was choosing. Why this word, and you know that word has a double meaning, and which meaning did you mean? And she challenged me on some other places like, for example, there’s a moment in the film where Ellen’s character calls Sharon’s character a tart, and she picked that word. She said, “You need a word of her generation.” I can’t remember what I had in there. Maybe a ho, or something? She was very specific that it had to be a “tart” in that, and I love it when she says that word because her face sort of gets very tight in speaking that word. It was really that detailed, and then when we came to set, we had already done the work, and we had already made those choices so I just got out of her way. SKA: Wow. That’s fabulous. Well, it worked. She’s really powerful in the film. I enjoyed seeing her on film, actually, in something like this. It was just wonderful. SW: I can’t tell how much I enjoyed her, too, and I know she wants to direct. She has a script that she wants to direct, and I really, really hope that she does that. SKA: Oh, good for her. Yes, I interviewed Liv Ullmann. She’s directing now, too, which is fabulous. Could you speak to Sharon’s charity efforts? I hear that she’s quite the fundraiser, or if you know anything about that. SKA: I could just see her. I love it. Oh, that’s awesome. SW: How powerful she is in a room in these moments, but I’ve got to tell you, the flip side of that, of her as a human being. She is probably the most generous, naturally generous, person I have ever met, and not just as a director and how she works with other actors, but also in the whole production process. She opened up her home. She knew we really didn’t have a rehearsal space. She was like, “Just come here. We can have it here,” and she sent up gourmet food when we were there. Whenever I needed help during pre-production, and somebody not returning my phone calls, she would jump on the phone. As a person, she really is an incredible person. Gilles Marini alluded to that. He did an interview for the Hallmark Channel for their news network, and he said, “She’s really a generous person, and most people don’t know that,” and he is so right. She is like generous down to her bones. SKA: Yes, and that was what I wanted to relay in the interview. I just have one more question. Is there anything else you’d like to say about the film that you’d like readers to know, and our listeners to know? SW: Oh, well, the one big chance I feel about putting this film out into the world is it’s a chance for people of a certain age to watch a character on screen who’s in her fifties, and made a lot of mistakes, and doesn’t really have her life together just quite yet, and guess what? In her fifties, she finds her way. She finds her career. She finds her love. She finds her passion, and she comes into her own. So, the message of the film that I’m really most proud of is that any day can be the first day of the rest of your life. It doesn’t matter if you’re twenty or thirty. You can start it right now. You can commit to a goal, and you can give it a shot, and you never know when it’s going to happen for you. So, in that way, even if just a handful of people walk out of the movie viewing experience empowered in their own lives, I’ll feel gratified that I did something important. SKA: And you should. Really. I believe you should. Yes, thank you. SW: You’re a really good interviewer. You made me think about new things. Thank you. SKA: Oh, good. Well, thank you. Best of luck with the film, I’m hoping I interview you again for your next movie so keep me posted.